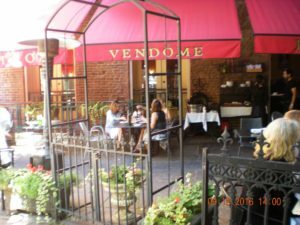 A pleasant French style bistro, located in a courtyard just off the busy downtown pedestrian street, this restaurant offers simple and familiar French cuisine made with fresh local ingredients. As their website claims, “This is purposefully a bistro, not a café nor a brasserie. The selection of the name “Bistro Vendôme” reflects our desired image in the community: a local favorite in a downtown rich with history that offers an exceptional dining experience in a charming, neighborhood setting.” They feature an extensive selection of over 60 wines from every French wine producing region.